IT CapEx Planning Tool | Integration Technologies, Inc.
December 6th, 2018 Integration Technologies, Inc. This planning tool is similar to what we use for our small business customers we support. 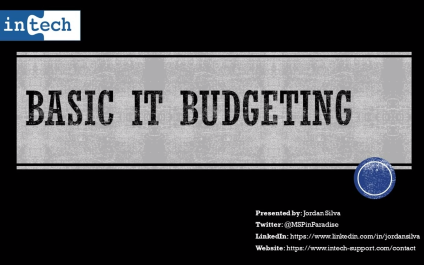 It quickly guides you through creating an annual IT budget based on a few questions you answer. Output a report suitable for the most demanding accountant, or just forward the results to your CEO or CFO. Servers – Make sure it is under warranty with the manufacturer, unless you are planning for RAPID growth (30%.yr or more) go with a 4-5 year initial warranty and keep the warranty extension out to 7 years as an option to use in the event growth slows, if growth goals are hit, replace at 4 years and repeat. Printers – Ensure they are either under maintenance contracts or warranty, look for ways to automate supplies replenishment to reduce admin overhead, plan for replacement every 5-7 years to avoid downtime. Firewalls and Routers – Replace every 3-5 years to ensure security features remain strong and to ensure the network interfaces on them allow you to get the most out of the bandwidth you are paying for. If you pay for redundant ISP services, consider redundant firewalls to prevent downtime as well. Access Points – Replace every 5 years to ensure recent Wi-Fi vulnerabilities are addressed and modern standards are available for laptops and mobile devices. Replacement scheduling – Depending on your needs above, we recommend replacing a portion of your workstations each year (for example, with 5-year life expectancy, replace 20% of workstations each year). Rolling down – We sometimes recommend moving older hardware to lower need people instead of throwing away 3 year old computers. Spares – Keep spare workstations available when downtime is costly (for example, total spares = 5% of total fleet, so if you have 100 workstations you should keep 5 spares available). Of course, if you don’t need the granular planning of a tool like this, you can just take the number of years you want to keep a workstation and divide that into 100. For example, if you expect to replace your computers every 6 years, you would budget for replacing 18% (100/6=18%) of your computers every year. We’d also recommend budgeting for replacing servers, firewalls and access points on that same 6-year schedule to keep your hardware and OS versions fresh enough to prevent the worst type of exploits.